(4) Matches (I have been going through a ton lately learning how to start a fire in a wood burning stove) from iomoi. Wonderful list! I would love any...or ALL of them. yes, wonderful list. i can see myself writing a beautiful letter and holding the paper down with my paper weight with a "C" in the amazing scented room with my jo malone candles lit by these cutie pie matches by iomoi. when done, placing my pen back in the stylist pencil case! Great ideas for the stocking! 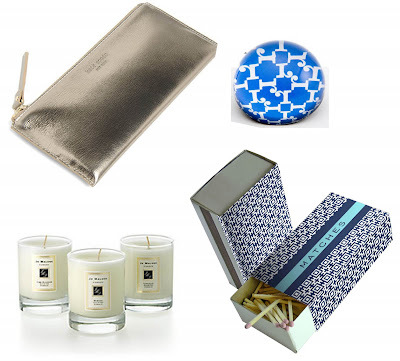 I candles and the stylish matches. Thanks for visiting my blog I hope you visit again. Oh, Callie I love it! the pencil case has my name all over it- what a great find! thanks for the stocking ideas, I love them all.